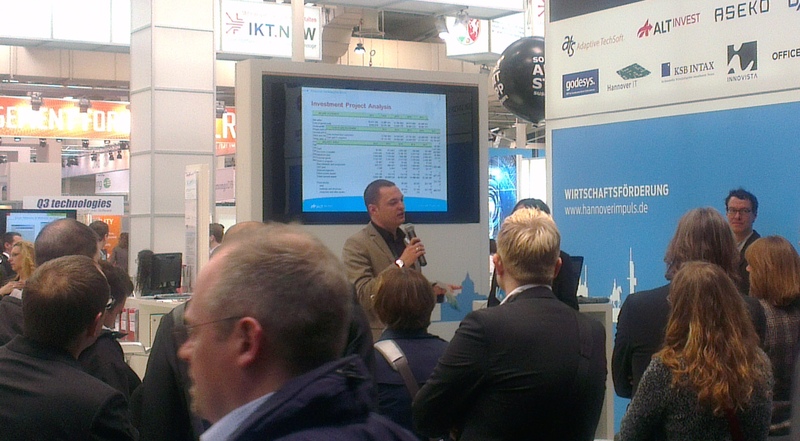 This week we are working at CeBIT fair in Hannover. It is one of the biggest computer fairs in the world, and it is the starting point for our business in Germany. We did not expect much from the fair itself. Our product is something between financial consulting and software, and the fairs are more about pure software or even hardware solutions. However, we have got new contacts, made the first steps to support visibility in the market and trained ourselves in the presentations. On Wednesday Alt-Invest broke through to the big screen, but on other days we were much less sensational. We did not buy a stand. Instead we bought a place at the Hannover Impulse stand, the company that supported us while we were creating the subsidiary. We used this stand as a base for negotiations with potential partners and job candidates. The fair also was a cause for me to see our new German office and to meet the first local employee. The office is a bit far from the centre, but in an excellent brand new building. It looks very nice and our room is perfect. Andrey Senov, our commercial director, underlined several times that the office building has a shower, next to our office, which is very good if you come in for one day for meetings. He was joking, but taking into account all my plans for this year, the idea of flying from city to city having showers in offices looks plausible though not very pleasant. As we worked all the day at the fair and in the meetings, our visit to the office happened to be in the night :). The fair is packed with Big Data businesses. The term is so popular that every company that works with the Internet or databases regards as its duty to put ‘Big Data’ in the title of the stand. Our hall specialised in CRM, so the quantity of Big Data businesses was beyond all measure. Here are some robots, some cars and a little bit of everything. It is enough to spend a day or two, but boring if you spend long days here for a week. The territory of the fair is vast and I cannot see how they can cover the investment in it. For example, I am writing this text in the huge conference center (it is on the left in the photo), and the center is nearly empty though it is Wednesday, and the main fair of the year is in full swing. I guess that the answer is very simple: they cannot. 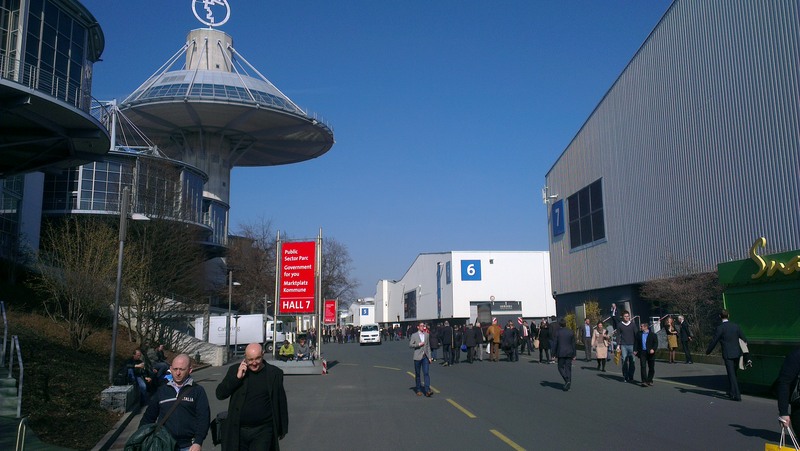 So my expectation is that CeBIT as I knew it is dying and it is my last time here. It is a good event, but it is losing the former importance it once had. Who knows though? Conferences at other venues flourish and the problems here can be tactical failures instead of a global trend. Anyway, it was pleasure to have a place to hide out from the continuous noise in the hall. 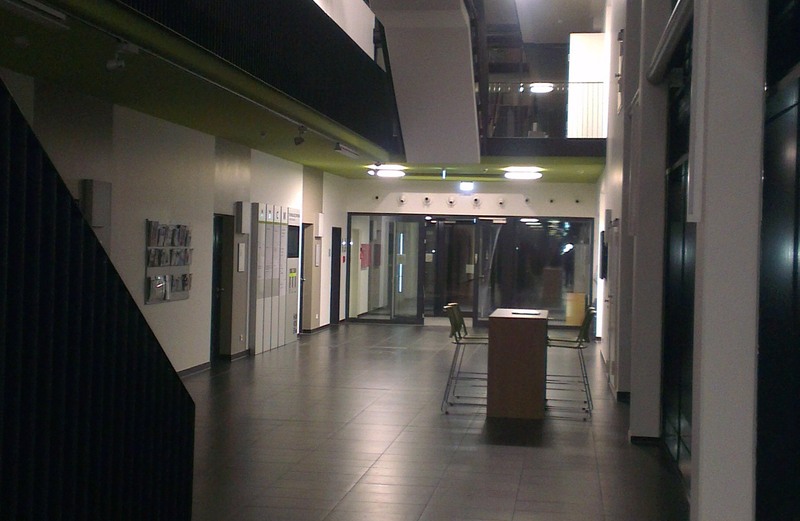 Our hall and the futuristic conference centre. And now, after all the preparations, it is the first week of our real work in Germany. Hurrah!